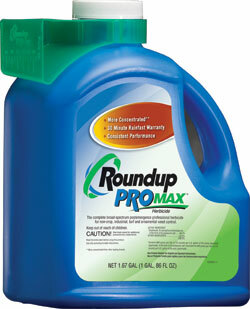 Roundup PROMAX offers a higher concentration than Roundup Pro and a 30-minute Rainfast warranty. It comes in a smaller, more convenient jug, requiring less storage space. With its more concentrated formula, 1 gallon of the weed killer contains the glyphosate-acid equivalent of 6 quarts of Roundup Pro.